The Bobst Library at NYU has a few tutorials and a library tour available along with some professional development podcasts featuring librarians talking about their conference experiences and visits to other libraries. This is a great idea of sharing conference and meeting reports with colleagues. The UC Santa Cruz Library (go Banana Slugs!) has audio of speakers from a couple of lecture series the put on in the library. Again, if you're working hard to bring in speakers of any kind, try to get a release and podcast them! You'll get a good bit of extended value and exposure for the effort. The Bibliocasting list is a great resource to connect with other folks interested in the world of library podcasting! Just when I thought my EBSCO podcasting and libraries RSS feed was on the fritz, I got an update for this article today. I need to get a copy from another campus but it sounds like a very interesting read. Worcester, Lea and Evelyn Barker. "Podcasting: Exploring the Possibilities for Academic Libraries". College & Undergraduate Libraries. 13.3 (2006): 87-91. "Podcasting is a recent phenomenon on the Internet, which offers academic libraries an alternative channel for communication with faculty and students. This paper describes podcasting, and offers examples of its use in academic and public libraries. The paper concludes with a description of the University of Texas at Arlington Libraries' experiences in creating a podcast and suggestions for libraries considering podcasting." I ran across another "new to me" podcast on the Bibliocasting list today, The Book of Life. The podcast is produced by Heidi Estrin the library director at Congregation B'nai Israel in Boca Raton, Florida. The description is "Jewish people and the books we read" and that description is very apt. There is also a Podzinger widget on the blog that lets you search the contents of the episodes. Very cool! I had a chance to play around with Camtasia 4 today and made a narrated movie of my Internet Librarian PowerPoint presentation. I had to fight with the microphone settings a little but I think it turned out OK. I practiced saving as in both Flash and MOV QuickTime formats which worked fine. Although I think I need to investigate the QuickTime output settings more as the file was pretty large (236MB). Or maybe they're just always that big, and the movie is almost 13 minutes long. The initial process of producing the project was very easy though. I uploaded to blip.tv if anyone wants to take a look. And here's the link to the QuickTime version too. For some reason Blogger keeps rejecting the code for putting a player directly in the post, which worked fine when I posted the Xlerator video from YouTube. Any tips from Blip.tv users?? 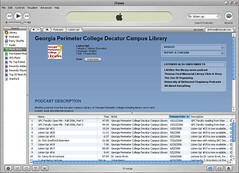 There was a question in the "Podcasting: A Primer For Libraries" session yesterday about adding your podcasts to the iTunes Music Store. I meant talk a little more about this and promoting your podcasts in general but ran out of time. If you're taking time to create podcasts of any kind, you're obviously going to want people to be able to find them. One good way to do that is with a good podcast webpage, like the ones we looked at in the session today. Another good tip is to get your podcasts include in as many podcast directories/ search tools as possible. Most will let you submit your podcast by giving them the URL for your RSS feed, choosing a category (if a directory), and adding some tags (keywords that describe your podcasts) so people can find your stuff. Adding your podcast to the iTunes Music Store works pretty much the same way. From the Music Store, click on the podcast section. Then scroll down to the bottom of the page and click "Add a Podcast" under Learn More. Enter the URL for your RSS feed and follow the steps to add a description, your web site address and choose a category. In a couple of days your podcast will show up in the directory. You will need an iTunes account to do this. Very easy! The Feedburner SmartCast feature also lets you easily add an image for your storefront and some additional tags. Interestingly, people who subscibe to our podcast also like "The Zen of Organizing" and "All About Everything" in addition to other libcasts! There were a couple of questions in my ACRL Virtual Institute session yesterday about podcasting statistics and feedback. Our hosting site provides pretty good statistics for each file, including how often they've been downloaded and if the downloads were subscription based from iTunes or some other podcast receiver or directly downloaded from the web. The free Feedburner service provides similar statistics for number of times a file is download from your feed, but not as comprehensive. If you're hosting on your own server, you should be able to get stats from your server administrator on usage too. We've had around 6,000 downloads of our podcasts at GPC since April of 2005. We've settled into each episode averaging between 100 and 150 or so downloads. There has been a shift from most of our traffic coming from iTunes to more like 40% iTunes and 60% direct web downloads. Just a guess, but I think the balance has shifted from library folks sampling our podcasts to more local listeners. Events such as readings and lectures tend to get the most downloads. As far as feedback, I used to try to get people to comment on our podcast blog about what they like and would like to hear in the future. I didn't get much feedback that way. But I do get a ton of informal feedback just walking around campus etc. When someone says "hey, you're the podcast guy" I try ask them for input. I also get a ton of input from faculty/ administrators, especially if I sent out email notices of new podcasts. Old school, but some folks are slower to jump on the RSS bandwagon than others. We now have a statement on our podcast page to give input and I'm going to set up a survey probably when next semester starts. Any other ideas on how to get feedback? And of course make sure to listen to what feedback you get and act on it! 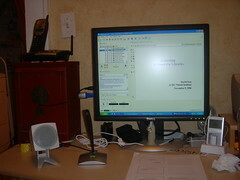 Audacity Tutorials Page - List of tutorials compiled by Audacity. Contains a link to the users manual too. Audacity Tutorial For Podcasters - From How To Podcast tutorial site. You'll find tons more by doing a web search for audacity tutorials. Thanks to everyone who came to my ACRL Fall Virtual Institute presentation today. Hopefully everyone got at least one tip out of it. I had a blast doing it. And learned a lot about doing webcasts in the process. The presentation and related materials are available on my presentation wiki. I answered a few of the questions I didn't get to in the session on the FVI discussion board. I'll probably post them here tomorrow too. Please let me know if you have any other questions. Or comments about topics you would have liked to seen covered in greater detail. Here's a list of library podcast links for my ACRL Virtual Institute presentation. 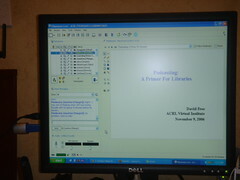 Links to podcasting resources are available on the presentation wiki. This morning I attended Paul Pival's SirsiDynix Institute webcast called "Show and Tell The Easy Way: An Introduction To Screencasting". It was a very informative session with lots of great info that I can use as I start playing with making screencasts. Paul has some links from the session on his blog along with the PPT of the session. The following notes are more for my use than anything else! -use audio: enthusiastic voice! record acudio as capture or dub later, speak clearly, captioning? -ipod: camtasi 4 direct mp4 for video ipod - images really small! The list of participants for the ALA Emerging Leaders program is now available. I'm psyched to see that two of my all time favorite library folks, Sarah Steiner from Georgia State and Michelle Boule of the University of Houston, are on the list. I've worked with Sarah on a couple of presentations and had the opportunity to meet Michelle at a couple of conferences this year. They are both super bright, articulate, energetic folks (and great friends) who will have a lot to offer the program. If they're indicative of the caliber of participants, it should be an amazing experience for everyone. There are also a few more Georgia librarians on the list who I haven't had the pleasure to meet, or have just met briefly: Justin Otto from Emory, Deborah Raftus from UGA, Bonnie Tijerina from Georgia Tech, and Shaundra Walker from Georgia College and State University. Nice to see so many great local folks involved. If any of you have blogs, let me know! This has been noted a couple of other places but I got to meet Troy Swanson from Moraine Valley Community College at IL. I spoke with him and a couple of colleagues on the phone a bit ago about setting up podcasting for their library. And now it's live! They've got a couple of events up so far which look great. Make sure to check out Troy's post to their development blog (super cool!) about their planning process and linking what they're doing with the library's mission statement. A great example of tech planning in general! Great model all the way around. Speaking of IL, I've started posting my presentation materials on a wiki to try to keep info more current. In the past I was making pages on my work web space for talks, which made things like lists of tools and articles pretty static. Now I've got a page for podcasting tools and one for library related resources like articles and such that I'll link to the page for each talk. Super easy! These are a work in progress, but I guess that's really the nature of a wiki. A perpetual work in progress. One thing I want to have on the library podcasting page is a collection of links to presentations people have done about their podcasting projects. Christine Drew from WPI sent me a link to her recent talk at Dartmouth (thanks Christine!) and I linked to Chris Kretz's HEBC presentation about the Omnibus. I would love to link to more to give a good range of real world examples of how people are planning for and using podcasts. So if you're podcasting and talking about it and want to share, send me a link and I'll post it. I was going to post my IL talk but realized it made no sense whatsoever without narration. So it's going to be my first test of screencasting with Camtasia next week. Fun.